Pretty Poison Now in Season: Poison Ivy Survival Tips From Topical BioMedics, Inc.
It’s a particularly strong year for poison ivy, so it’s important for everyone to be aware there are ways to prevent outbreaks, or safely treat rashes. Summer is kicking into gear, and poison ivy is lush and plentiful. A master of disguise, it can take the form of a vine, shrub or ground cover, has leaves that are shiny or dull, with the edges smooth or notched. So how can it be recognized for the pretty poison it is? The phrase “Leaves of three, let it be” is a good rule of thumb, and if there are white berries, we should heed the advice to “take flight.” Whether hiking in the woods, gardening, or playing in the yard, it’s important to be aware of any plant with three leaflets. Poison ivy tops the list of plants to avoid because it contains urushiol, an oily resin that binds to the skin on contact and may result in a hypersensitivity reaction characterized by itching, burning skin eruptions. This rash-causing poison ivy sap is a clear liquid found in the plant’s leaves and the roots. Urushiol oil is extremely potent, and only one nanogram (billionth of a gram) is needed to cause a rash. Even if you’ve never broken out you cannot assume you are immune as the more often you are exposed to urushiol, the more likely it is that you will break out. In fact, upwards of 90% of the population develops an allergy to it. Although poison ivy is now in full season, it is potent year round, and urushiol oil remains active for several years, so even handling dead leaves or vines can cause a reaction. In addition, oil transferred from the plant to other objects—such as gardening tools, an article of clothing, or even a pet—can cause the rash when it comes in contact with human skin. If poison ivy is eaten, the mucus lining of the mouth and digestive tract can be damaged. And if poison ivy is burned and the smoke inhaled, a rash may appear in the lining of the lungs, causing extreme pain and respiratory difficulty that may become life-threatening. Most people develop a rash after coming in contact with the plant. After the oil has touched the skin it takes about 12 to 36 hours for redness and swelling to appear, followed by blisters and itching. Contrary to popular belief, scratching or oozing blister fluid cannot spread the outbreak or transfer it to other people. New lesions that appear a few days after a breakout of primary lesions means that there was less oil deposited on that area of the skin, or that the skin was less sensitive to it. You and your family can have a more enjoyable summer by following these tips for avoiding outbreaks of poison ivy, along with these helpful treatments for soothing and healing rashes if you do succumb. Avoiding contact with the plant is, of course, the best prevention. Go on an expedition, wearing long pants, a shirt with long sleeves, boots, and gloves to minimize exposure. Tour your yard, the playground, a campsite you’re visiting, and any other outdoor areas you frequent. When you spot poison ivy, show it to your kids and instruct them to stay away from it. If you have a large amount growing in your yard, consult with a professional landscaper for removal. (Unless you are a professional, do not “weed whack” as it sprays the poison ivy—and hence the oil—right at you.). Wear pants, long sleeve shirts, and gloves so less skin is exposed when you are working or playing where poison ivy may be present, such as when hiking, cutting down trees in the woods, mowing brush, etc. It is recommended that you wear plastic gloves over cotton gloves because urushiol can eventually soak through cotton gloves. Prior to any outdoor activity, apply odorless, greaseless Topricin Pain Relief and Healing cream to any exposed areas of your body, including face, neck, hands, arms, etc. This will form a protective barrier that makes it more difficult for the urushiol oil to bond with your skin. Topricin contains natural medicines that also antidote and neutralize the adverse affect of urushiol oil. As an added plus, Topricin is the gardener’s favorite for relieving all the aches and pains of doing yard work. Urushiol oil is extremely stable and will stay potent for years–which means you can get a rash from clothing or tools that got oil on them many seasons ago. After exposure to poison ivy, put on gloves and wipe everything you had with you and on you with rubbing alcohol and water, including shoes, tools, and clothing. Then wash clothes at least twice before wearing (if possible using bleach), hose off garden tools well, and apply leather moisturizer on footwear to prevent them from drying out (again, put on gloves). Change your shoe/boot laces once exposed to poison ivy. Pets seem to be immune from getting poison ivy, but many people do get a rash from the residual urushiol oil on their fur. Therefore it’s a good idea to bath our dog or cat wearing thick rubber gloves (not latex). After washing the pet, wash yourself using cold water to keep pores closed. Consult with your veterinarian if you have any questions. Urushiol binds to skin proteins and begins to penetrate within 15 minutes of contact. If treated before that time, a reaction may be prevented. First, wash exposed site with cold water (hot water will open your pores, allowing the oil in). Follow this by bathing it in milk, which helps to get between the oil and the skin. Dry off well and then apply Topricin, which will help neutralize the effect of any remaining urushiol oil left on your skin. Scrub under your nails. You can spread poison ivy to other parts of your body by having the oil on your fingers. Wherever poison ivy grows, there is usually a plant known as jewelweed growing close by—especially in moister, shadier areas. Herbalists and Native Americans have used jewelweed for centuries to treat and speed the healing of poison ivy as it seems to be a natural remedy. When you are in the field and may have been exposed to poison ivy, pick jewelweed, slice the stem, and rub its juice on your skin to ease irritation and help prevent a breakout. Some companies and herbalists offer poison ivy treatment soaps that contain jewelweed and other soothing natural ingredients, such as pine tar. Soaps are available from Poison Ivy Soap Company, Burt’s Bees, or search online for sources. Take homeopathic Rhus Tox 30X tablets to help build immunity to poison ivy. For severe outbreaks, or if you have any concerns whatsoever, see your doctor right away. 20 years in business and a Certified B Corporation, Topical BioMedics is a research and development leader in topical patented natural biomedicines for pain relief. The company’s flagship product, Topricin® Pain Relief and Healing Cream, was introduced in 1994 and is now a leading natural therapeutic brand. A combination biomedicine formula, Topricin has been awarded a patent for the treatment of pain associated with fibromyalgia and neuropathy, and was listed among the Top 100 Green Products of 2012 by Healthy Holistic Living. 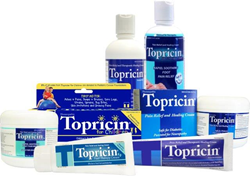 The Topricin family of natural healing products also includes Topricin Foot Therapy Cream, specially formulated to treat painful foot and ankle issues and conditions, and Topricin for Children, which received the Parent Tested Parent Approved Seal of Approval (with 5% of sales donated to pediatric cancer foundations). Made in the U.S.A., all Topricin products are federally-regulated over-the-counter medicines with no known side effects, no parabens, petroleum, or other harsh chemicals, no grease, and no odor. Topricin is available in independent pharmacies, natural food and co-op stores nationwide, including Whole Foods, Sprouts, Pharmaca, The Vitamin Shoppe, Fred Meyer, Wegmans, CVS (Foot Care Section), Walgreens (Diabetic Section), and other fine retailers, as well as directly from the company. For more information visit http://www.topricin.com.